Macrophages play a relevant role in innate and adaptive immunity depending on the balance of the stimuli received. From an analytical and functional point of view, macrophage stimulation can be segregated into three main modes, as follows: innate, classic, and alternative pathways. These differential activations result in the expression of specific sets of genes involved in the release of pro- or anti-inflammatory stimuli. In the present work, we have analyzed whether specific metabolic patterns depend on the signaling pathway activated. A [1,2-13C2]glucose tracer-based metabolomics approach has been used to characterize the metabolic flux distributions in macrophages stimulated through the classic, innate, and alternative pathways. Using this methodology combined with mass isotopomer distribution analysis of the new formed metabolites, the data show that activated macrophages are essentially glycolytic cells, and a clear cutoff between the classic/innate activation and the alternative pathway exists. Interestingly, macrophage activation through LPS/IFN-γ or TLR-2, -3, -4, and -9 results in similar flux distribution patterns regardless of the pathway activated. However, stimulation through the alternative pathway has minor metabolic effects. The molecular basis of the differences between these two types of behavior involves a switch in the expression of 6-phosphofructo-2-kinase/fructose-2,6-bisphosphatase (PFK2) from the liver type-PFK2 to the more active ubiquitous PFK2 isoenzyme, which responds to Hif-1α activation and increases fructose-2,6-bisphosphate concentration and the glycolytic flux. However, using macrophages targeted for Hif-1α, the switch of PFK2 isoenzymes still occurs in LPS/IFN-γ–activated macrophages, suggesting that this pathway regulates ubiquitous PFK2 expression through Hif-1α-independent mechanisms. The innate immune system acts as the first line of defense and functions by recognizing highly conserved sets of molecular patterns (pathogen-associated molecular patterns [PAMPs]) through a limited number of germline-encoded receptors called pattern-recognition receptors. TLRs, a class of pattern-recognition receptors, have the ability to recognize pathogens or pathogen-derived products and initiate signaling events leading to activation of innate host defense (1, 2). Macrophages play an essential role in the immune response and normal tissue development by producing proinflammatory mediators and by phagocytic clearance of pathogens and apoptotic cells (3, 4). It has been described that macrophages could undergo different activation processes depending on the stimuli received (5, 6). The classic activation, which can be induced by in vitro culture of macrophages with IFN-γ and LPS (inducing TNF-α production), is associated with high microbicidal activity, proinflammatory cytokine, and reactive oxygen species production and cellular immunity; the innate activation, which is mediated in culture by ligation of receptors, such as TLRs, is associated with microbicidal activity and proinflammatory cytokine production; the alternative activation, which can be mimicked in vitro after culture with IL-4, IL-13, glucocorticoids, immune complexes, or IL-10, is associated with tissue repair, tumor progression, and humoral immunity (7). Some authors also distinguish macrophage deactivation, which is induced by cytokines, such as IL-10 or TGF-β, or by ligation of inhibitory receptors, such as CD200 receptor or CD172a, and is related to anti-inflammatory cytokine production and reduced MHC class II expression (8, 9). Under normal conditions, macrophages are recruited and phagocyte at sites of infection. In addition to playing a crucial role in immunity, some of the mammalian TLRs have been described to regulate bodily energy metabolism, mostly through acting on adipose tissue. This has recently opened new avenues of research on the role of TLRs in pathologies related to metabolism, such as obesity, insulin resistance, metabolic syndrome, or atherosclerosis (10). The accumulation of fatty acids, above all cholesterol in low density lipoprotein form, is the main reason that lipid metabolism has been studied in macrophages in the atherosclerosis framework. Recent works have built a fatty acid bridge between diet and immune system due to the induction of TLR expression by some fatty acids (11). However, few are known on central metabolism patterns in macrophages since the work of Newsholme and collaborators (12–14) in the 1990s. In this study, we will apply a system biology approach to shed some light in the cross-talk between signal transduction and central metabolism in macrophages. We studied whether the distinct stimulation pathways required different energy demands or have different metabolic patterns. To achieve these goals, tracer-based metabolomics experiments have been used and combined with analysis of the expression of markers of activation. Following the normal activation process of the macrophages, cells were fed with [1,2-13C2]glucose, a nonradioactive isotope of glucose that will incorporate [13C] carbons into metabolite end products (i.e., lactate, glutamate) and the ribose of RNA. This tracer has been broadly used before (15). Our data show that activated macrophages are essentially glycolytic cells, and a clear cutoff between the classic/innate activation and the alternative pathway exists. Interestingly, activation through TLR-2, -3, -4, and -9 results in similar patterns of metabolic activation, despite the use of at least in part distinct signaling pathways and expression of different sets of genes. In the classic and innate activation we observe a shift in the expression of the 6-phosphofructo-2-kinase/fructose-2,6-bisphosphatase (PFK2) isoforms, from the liver type-PFK2 (L-PFK2), which has a low net activity, to the more active ubiquitous PFK2 (uPFK2) that maintains higher fructose-2,6-bisphosphate (Fru-2,6-P2)concentrations due to a minor bisphosphatase activity and, therefore, potentiates the glycolytic flux (16–18). This isoenzyme is expressed in response to hypoxia through Hif-1α activation (16). Interestingly, LPS challenge results in an increase in Hif-1α levels that might contribute to this uPFK2 expression (19–21). Using macrophages targeted for this transcription factor, we have investigated the contribution of Hif-1α to the enhancement of the glycolytic flux and to the expression of inflammatory molecules in response to classic and alternative activation (22, 23). Reagents were from Sigma-Aldrich (St. Louis, MO), Roche (Basel, Switzerland), Invitrogen (Carlsbad, CA), or Merck (Darmstadt, Germany). TLR ligands were from InvivoGen (San Diego, CA). Cytokines were from PeproTech (Rocky Hill, NJ). Commercial Abs were from Santa Cruz Biotechnology (Santa Cruz, CA), Cell Signaling Technology (Danvers, MA), Abcam (Cambridge, U.K.), R&D Systems (Minneapolis, MN), Sigma-Aldrich, or PeproTech. Serum and media were from BioWhittaker (Walkersville, MD). Commercial Pfkfb3 small interfering RNAs (siRNAs) were from Ambion (Austin, TX), and Pfkfb3 TaqMan gene expression assays were from Applied Biosystems (Carlsbad, CA). [1,2-13C2]glucose (>99% enriched) was purchased from Isotec (Miamisburg, OH). Mice were housed and bred in our pathogen-free facility. C57BL/6 mice were used for macrophage isolation. Mice with myeloid lineage-specific HIF1α floxed-UBC-cre/ERT2 mice for conditional HIF1α inactivation were used (24, 25) and were a generous gift of M. Landázuri and J. Aragonés (Hospital La Princesa, Madrid, Spain). Experimental procedures were approved by the Committee for Research Ethics of the Universidad Autonoma de Madrid in accordance with Spanish and European guidelines. Animals were used aged 8–12 wk, as follows: 4 d prior to the assay, mice were i.p. injected 2.5 ml 3% (w/v) of thioglycolate broth (26). Elicited peritoneal macrophages were prepared from light-ether anesthetized mice (four to six animals per condition), killed by cervical dislocation, and injected i.p. 10 ml sterile RPMI 1640 medium. The peritoneal fluid was carefully aspirated, avoiding hemorrhage, and kept at 4°C to prevent the adhesion of the macrophages to the plastic. An aliquot of the cell suspension was used to determine the cell density in the peritoneal fluid. The cells were centrifuged at 200 × g for 10 min at 4°C, and the pellet was washed twice with 25 ml ice-cold PBS. Cells were seeded at 1 × 106/cm2 in RPMI 1640 medium supplemented with 10% of heat-inactivated FCS and antibiotics. After incubation for 3 h at 37°C in a 5% CO2 atmosphere, nonadherent cells were removed by extensive washing with PBS. Experiments were carried out in phenol-red free RPMI 1640 medium and 1% of heat-inactivated FCS plus antibiotics (26). When glucose concentration was changed, this was added to glucose-free RPMI 1640 medium. Prior to stimulation, the medium was aspirated and replaced by warm medium containing the indicated TLR ligand or cytokine. When the murine macrophage RAW 264.7 cells were used, they were processed as indicated for the peritoneal macrophages. Cells were harvested and washed in cold PBS. After centrifugation at 4°C for 5 min and 1000 × g, cells were resuspended in annexin V-binding buffer (10 mM HEPES [pH 7.4], 140 mM NaCl, 2.5 mM CaCl2). Cells were labeled with annexin V FITC solution (BD Pharmingen, San Jose, CA) and/or propidium iodide (PI; 100 μg/ml) for 15 min at room temperature in the dark. PI is impermeable to living and apoptotic cells, but stains necrotic and apoptotic dying cells with impaired membrane integrity, in contrast to annexin V, which stains early apoptotic cells. Cultured macrophages (6-cm dishes) were homogenized in 1 ml medium containing 20 mM potassium phosphate (pH 7.4, 4°C), 1 mM DTT, 50 mM NaF, 0.5 mM PMSF, 10 μM leupeptin, and 5% poly(ethylene)glycol. After centrifugation (7000 × g for 15 min), poly(ethylene)glycol was added to the supernatant up to 15% (mass/v) to fully precipitate the PFK2. After resuspension of the pellet in the extraction medium, PFK2 activity was assayed at pH 8.5 with 5 mM MgATP, 5 mM Fru-6-P, and 15 mM Glc-6-P. One unit of PFK2 activity is the amount of enzyme that catalyzes the formation of 1 pmol Fru-2,6-P2 per minute (17). Fru-2,6-P2 was extracted from cells (24-well dishes) after homogenization in 100 μl 50 mM NaOH, followed by heating at 80°C for 10 min. The metabolite was measured by the activation of the pyrophosphate-dependent phosphofructo-1-kinase (17). Lactate and glucose were measured enzymically in the culture medium. NO release was determined spectrophotometrically by the accumulation of nitrite and nitrate in the medium (phenol red free). Nitrate was reduced to nitrite, and this was determined after reduction of nitrate to nitrite and the latter with Griess reagent (26) by adding 1 mM sulfanilic acid and 100 mM HCl (final concentration). The accumulation of TNF-α, IL-6, and IL-10 in the culture medium was measured per triplicate using commercial kits (Biotrak, GE Healthcare, Barcelona, Spain, [TNF-α and IL-6] and eBioscience, San Diego, CA [IL-10]), following the indications of the supplier. The macrophage cultures (six-well dishes) were washed twice with ice-cold PBS, and the cells were homogenized in 0.2 ml buffer containing 10 mM Tris-HCl (pH 7.5), 1 mM MgCl2, 1 mM EGTA, 10% glycerol, 0.5% CHAPS, 1 mM 2-ME, and 0.1 mM PMSF and a protease inhibitor mixture (Sigma-Aldrich). The extracts were vortexed for 30 min at 4°C and centrifuged for 15 min at 13,000 × g. The supernatants were stored at −20°C. Proteins levels were determined using the Bio-Rad (Richmond, CA) detergent-compatible protein reagent. All steps were carried out at 4°C. Samples of cell extracts containing equal amounts of protein (30 μg/lane) were boiled in 250 mM Tris-HCl (pH 6.8), 2% SDS, 10% glycerol, and 2% 2-ME, and size separated in 10–15% SDS-PAGE. The gels were blotted onto a polyvinylidene difluoride membrane (GE Healthcare) and processed as recommended by the supplier of the Abs against the murine Ags: NO synthase-2 (NOS-2; sc-7271), cyclooxygenase-2 (COX-2; sc-1999), MHC-II (sc-59322), hemeoxygenase-1 (AB-1284), Arg-1 (sc-20150), suppressor of cytokine signaling-3 (2923s), KC/CXCL1 (AF-453-NA), IFN-γ–inducible protein-10 (IP-10)/CXCL10 (500-p129), L-PFK2 (sc-10096), Hif-1α (MAB1536), and β-actin (A-5441). For uPFK2, specific peptides of the isoenzyme were used to generate polyclonal Abs by immunization of rabbits (New Zealand White) with multiple intradermal injections with 300 μg Ag in 1 ml CFA, followed by boosters with 100 μg Ag in IFA (a gift of R. Barrtrons, University of Barcelona, Barcelona, Spain). The blots were developed by ECL protocol (GE Healthcare), and different exposition times were performed for each blot with a charged coupling device camera in a luminescent image analyzer (Molecular Imager, Bio-Rad) to ensure the linearity of the band intensities. A total of 1 μg total RNA, extracted with TRIzol reagent (Invitrogen) according to the manufacturer’s instructions, was reverse transcribed using Transcriptor First Strand cDNA Synthesis Kit for RT-PCR following the indications of the manufacturer (Roche). Real-time PCR was conducted with SYBR Green on a MyiQ Real-Time PCR System (Bio-Rad) using the SYBR Green method. PCR thermocycling parameters were 95°C for 10 min, 40 cycles of 95°C for 15 s, and 60°C for 1 min. All samples were analyzed for 36B4 expression in parallel. Each sample was run in duplicate and was normalized to 36B4. The replicates were then averaged, and fold induction was determined in ΔΔCt-based fold-change calculations. Primer sequences are available on request. For transient transfections, macrophages were seeded at 80% confluence and transfected using the Cell Line Nucleofector Kit V, following the manufacturer’s instructions (Amaxa, Cologne, Germany). Forty-eight hours after nucleofection with pfkfb3 Silencer Predesigned siRNA or a scrambled RNA (scRNA), macrophages were stimulated for 12 h and mRNA isolated. Transfections were performed in triplicate, and expression of a GFP vector was used as a control for transfection efficiency. Normalized expression data were obtained from National Center for Biotechnology Information GEO dataset GDS2429 (27) using GEOquery package from Bioconductor (Berkeley, CA) (28). Differential expression for the following comparisons was tested using limma Bioconductor package (29): 1) naive mature macrophage versus classic activated macrophage, and 2) alternatively activated macrophage. Two gene lists were generated after each comparison, and they were ranked according to the test statistic for subsequent gene set enrichment analysis (GSEA). Enrichment of gene sets of interest in each list was accomplished using the GSEA method, as described by Mootha et al. (30). We used “Which genes?” (www.whichgenes.org/) to retrieve the REACTOME (31) pathways as gene sets. The genes from the two lists were also mapped into canonical pathways using Ingenuity Pathway Analysis software (Ingenuity Systems, Redwood, CA; see Supplemental Material). The macrophage cultures (10-cm dishes) were washed twice with ice-cold PBS, and culture media were replaced by 50% enriched [1,2-13C2]glucose containing the indicated TLR ligand or cytokine. After incubation, cells were centrifuged (200 × g for 5 min), and incubation medium and cell pellets were obtained and stored at −80°C until processing. Glucose, lactate, glutamine, and glutamate incubation medium concentrations were determined, as previously described (32, 33), using a Cobas Mira Plus chemistry analyzer (HORIBA ABX, Montpelier, France). Lactate from the cell culture media was extracted by ethyl acetate after acidification with HCl. Lactate was derivatized to its propylamide-heptafluorobutyric form, and the m/z 328 (carbons 1–3 of lactate, chemical ionization) was monitored for the detection of m1 (lactate with a [13C] in one position) and m2 (double-labeled lactate) for the estimation of pentose cycle activity versus anaerobic glycolysis (34). RNA/Ribose was isolated by acid hydrolysis of cellular RNA after TRIzol purification of cell extracts. Ribose isolated from RNA was derivatized to its aldonitrile acetate form using hydroxylamine in pyridine and acetic anhydride. We monitored the ion cluster around the m/z 256 (carbons 1–5 of ribose, chemical ionization) to find the molar enrichment of [13C] labels in ribose (34). Glutamate was separated from the medium using ion-exchange chromatography (35). Glutamate was converted to its n-trifluoroacetyl-n-butyl derivative, and the ion clusters m/z 198 (carbons 2–5 of glutamate, electron impact ionization) and m/z 152 (carbons 2–4 of glutamate, electron impact ionization) were monitored. Isotopomeric analysis of C2–C5 and C2–C4 fragments of glutamate in the medium was done to estimate the relative contributions of pyruvate carboxylase and pyruvate dehydrogenase to the Krebs cycle (36, 37). Mass spectral data were obtained on the QP2010 Shimadzu mass selective detector connected to a GC-2010 gas chromatograph. The settings were as follows: gas chromatography inlet for glucose and ribose 250°C and 200°C for lactate and glutamate, transfer line 250°C, mass spectrometry source 200°C. A Varian VF-5 capillary column (30-m length, 250-mm diameter, 0.25-mm film thickness) was used to analyze all of the compounds studied. The data shown are the means ± SD of three or five experiments. Statistical significance was estimated with Student t test for unpaired observations. A p value of <0.05 was considered significant. Elicited peritoneal macrophages were isolated, maintained in culture overnight, and activated for the indicated periods of time through TLRs involved in innate immunity (TLR4, LPS; TLR2, lipoteichoic acid; TLR3, polyriboinosinic:polyribocytidylic acid; and TLR9, CpG), classic activation (LPS/IFN-γ), and alternative activation (IL-4/IL-13; IL-10) (5, 6). Fig. 1A shows the expression of a panel of representative markers of macrophage activation. NOS-2 and COX-2 were expressed in cells activated by the innate and classic response, except after CpG stimulation. MHC-II upregulation was very sensitive to LPS signaling and to the classic activation pathway, and Arg-1 was notably upregulated in response to IL-4/IL-13. Hemeoxygenase-1 was moderately induced by innate and alternative pathways of activation. 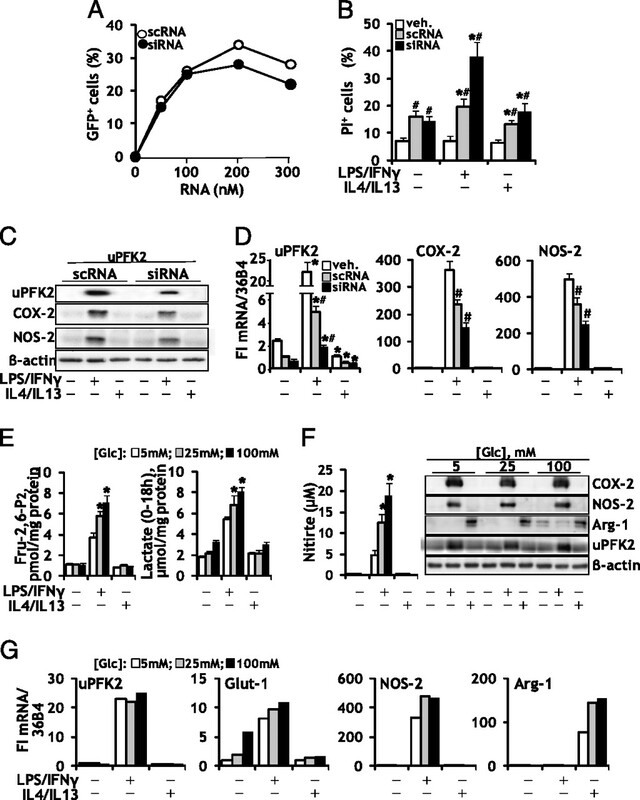 Suppressor of cytokine signaling-3 was upregulated in response to LPS or LPS/IFN-γ. 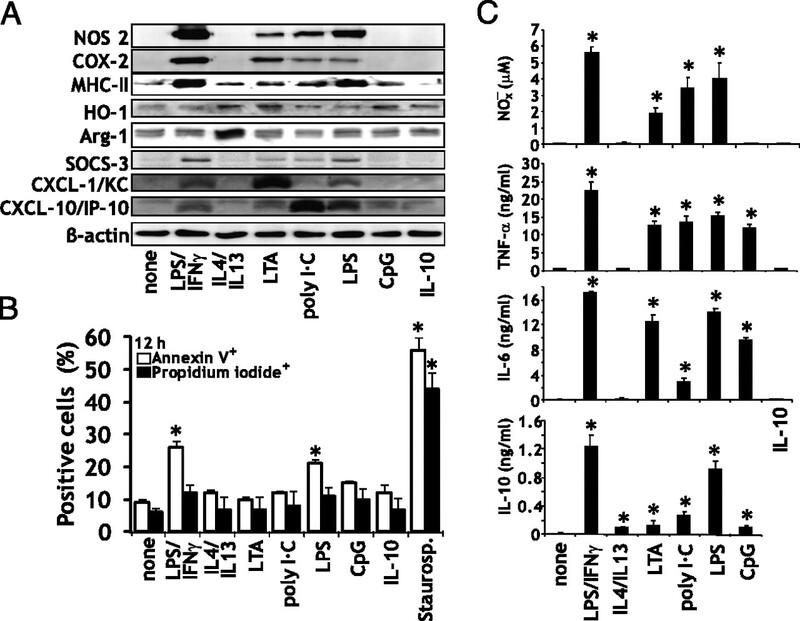 The chemokine CXCL1/KC was expressed in cells activated through classic activation pathway, and innate immunity mediated by TLR2 and TLR4 and CXCL10/IP-10 was upregulated through the classic and the innate response. In addition to these parameters related to macrophage activation, cell viability was determined; apoptosis was evaluated by annexin V exposure of the cells and by positivity for PI labeling, the later characteristic of dying cells. As Fig. 1B shows, an increase of annexin V was observed in cells treated with LPS/IFN-γ, and to a lesser extent with LPS; however, the percentage of PI-positive cells at this time (12 h) was modest, suggesting that the integrity of the plasma membrane remained preserved. These data were reminiscent of the expression of NOS-2, indicating that NO plays an important role in the induction of apoptosis in these cells (38). Staurosporine was used as a reference for apoptosis induction in macrophages (39). Moreover, the accumulation in the culture medium of nitrite/nitrate, IL-6, TNF-α, and IL-10 contributed to establish the profile of activation elicited by the different stimuli used; for example, CpG failed to promote NOS-2 expression, but notably increased IL-6 and TNF-α synthesis (Fig. 1C). Characterization of macrophages stimulated through the classic, innate, and alternative pathways. Peritoneal macrophages were maintained in culture and stimulated for 12 h with the indicated stimuli: LPS/IFN-γ (250 and 20 ng/ml, respectively); LPS (100 ng/ml); IL-13, IL-4, and IL-10 (20 ng/ml each); lipoteichoic acid (5 μg/ml); polyriboinosinic:polyribocytidylic acid (25 μg/ml); CpG (3 μg/ml); and staurosporine (100 ng/ml). The levels of the indicated proteins were determined by Western blot (A). The extent of apoptosis/necrosis was determined by the staining with annexin V and PI, respectively (B). The release of nitrite plus nitrate, TNF-α, IL-6, and IL-10 to the culture medium was determined, as described in Materials and Methods (C). Results show the mean ± SD of five experiments. *p < 0.01 versus the none condition. Previous data suggested the relevance of carbohydrate metabolism in the commitment for activation of macrophages (40–43). In this regard, we investigated the glucose consumption and fate in macrophages activated through the innate, classic, and alternative pathways. As Fig. 2A shows, two clear profiles were observed in terms of glucose consumption and lactate release. TLR activation promoted an enhancement in the glycolytic flux to lactate that can be divided into two time-dependent steps: one from 0 to 4 h, and a second flux rate from 4 to 12 h. Indeed, when the same experiment was performed with [1,2-13C2]-glucose, the incorporation of [13C] atoms from glucose in different metabolites, according to the scheme depicted in Fig. 2B, allowed the measurement of the precise contribution of these time-dependent fluxes in activated macrophages. From 0 to 4 h, the glycolytic activity was much lower than from 4 to 12 h (Fig. 2C). Interestingly, alternative stimulation exhibited a metabolic profile that essentially matched that of control cells, despite the influence of the expression of a specific set of genes (vide infra). Also, macrophages displayed a metabolic flux that involved the conversion of glucose into lactate by more than 95%, regardless of the activation pathway considered (Fig. 3A). The metabolic features revealed by glucose consumption and lactate release are followed by a basal consumption of glutamine and a release of glutamate (Figs. 2A, 3A). Besides, low enrichment in glutamate and RNA (Fig. 3A) evidenced the high glycolytic rate in peritoneal macrophages. Peritoneal macrophages are quiescent cells; however, when the macrophage cell line RAW 264.7 was used and kept overnight with 1% FCS, stimulation for 12 h under these conditions revealed that the basal proliferation rate of these cells did not influence the metabolic profile associated with the macrophage activation process. As Fig. 3B shows, RAW 264.7 cells followed a similar m0 (nonlabeled lactate) and m2 (double-labeled lactate produced from [1,2-13C2]glucose through glycolysis) mass isotope distribution than peritoneal macrophages, without differences in the distribution among the different pathways of stimulation, and with ~80% of the glucose label converted into lactate. However, proliferation induces higher metabolic fluxes and [13C] enrichment in ribose and glutamate (enrichment is the weighted sum of all the labeled species; Fig. 3C). Metabolic fluxes in macrophages stimulated through the classic, innate, and alternative pathways. The time course of glucose and glutamine consumption and lactate and glutamate release was determined enzymically by sampling the culture medium at periods of 2 h (A). Macrophages were loaded with [1,2-13C2]-glucose, and the [13C] trace was followed by GCMS to establish unambiguously the fate of glucose in cells stimulated by the classic, innate, and alternative pathways. [1,2-13C2]-glucose could follow the oxidative branch of PPP to provide [1-13C1]-ribose (═ line) or the upper part of glycolysis driving to the [1,2-13C2]-glyceraldehyde-3-phosphate formation (▬ line). Recycling through the nonoxidative branch of PPP allows the formation of [1-13C1]-glyceraldehyde-3-phosphate and [1,2-13C2]-ribose, respectively. Label pattern does not change in the lower part of glycolysis, and the lactate formed could drive into the four depicted isotopomers of glutamate, depending on whether pyruvate dehydrogenase or pyruvate carboxykinase is used to enter in the Krebs cycle (B). The fluxes of glucose consumption and lactate release using [1,2-13C2]-glucose were quantified from 0 to 4 h and from 4 to 12 h (C). Results show the mean of five experiments (A), and the mean ± SD of four experiments (C). *p < 0.01 versus the none condition. GCMS, gas chromatography/mass spectrometry. Metabolic fluxes using tracer-based distribution of [13C] in stimulated macrophages. Peritoneal macrophages were maintained in culture and stimulated for 12 h in the presence of [1,2-13C2]glucose, as indicated in Fig. 1. Samples of culture medium were collected at 4, 8, and 12 h, and the [13C] label distribution in lactate (m0, nonlabeled [13C0]lactate; m1, one label [13C1]lactate; and m2, two labels [13C2]lactate) was determined by GCMS to establish the metabolic fluxes (A). The macrophage cell line RAW 264.7 was stimulated in the presence of [1,2-13C2]glucose as indicated for peritoneal macrophages, samples of culture medium were collected at 6 and 12 h, and the distribution of the [13C] label was determined by GCMS to establish the metabolic fluxes (B). The comparison between peritoneal macrophages and the RAW 264.7 cell line of the main metabolic fluxes and [13C] enrichment in ribose and glutamate is shown in C. Results show the mean ± SD of four experiments. *p < 0.001 versus peritoneal macrophages. The previous experiments showed that the carbohydrate metabolism in macrophages is fundamentally glycolytic, and that the rate of glucose consumption is lower in alternatively activated macrophages than in those activated through the classic pathway. Therefore, the expression levels of genes involved in energetic metabolism may differ between the two types of macrophage activation. To test this hypothesis, we compared the functional enrichment (in up- or downregulated genes) of the following REACTOME (31) pathways: glycolysis, pyruvate metabolism and TCA cycle, and electron transport chain. Glycolysis was significantly enriched in upregulated genes after classic activation (false discovery rate [FDR] 0.032; Fig. 4A); however, the enrichment trend of glycolysis upon alternative activation was not significant (FDR 0.547; Fig. 4A, Supplemental Fig. 1). Moreover, pyruvate/TCA cycle pathways were most clearly enriched in upregulated genes after IL-4/IL-13 activation (FDR 0.097), whereas the opposite trend was observed for LPS/IFN-γ activation, although statistically not significant (FDR 0.455) (Fig. 4A, Supplemental Fig. 2). Noteworthily, the most significant enrichment (FDR 0.000) was found in electron-transport chain genes that were downregulated during classic activation, an effect not observed for the alternative activation (Fig. 4A, Supplemental Fig. 3). These data suggest that classic activation has a stronger effect on the expression of genes related with the energetic metabolism, favoring the upregulation of genes from the glycolytic pathway and the repression of genes encoding for proteins that participate in oxidative phosphorylation. GSEA of energy metabolism pathways and PFK2 isoenzyme switch in activated macrophages. The normalized enriched score calculated by GSEA was shown in the bars, and numbers indicated the FDR for the enrichment. Positive NES indicates enrichment in upregulated genes, whereas negative normalized enriched score corresponds to enrichment in downregulated genes; see Supplemental Material for more details (A). Peritoneal macrophages were maintained in culture and stimulated for 12 h, as indicated in Fig. 1. The levels of the L-PFK2 and uPFK2 isoenzymes were determined by Western blot using specific Abs. Cell extracts were prepared, and the activity of PFK2 was determined in vitro. The levels of Fru-2,6-P2 were determined in cell extracts after collection of the cell pellets in 50 mM NaOH at 80°C (B). Cotreatment of cells with LPS and IL-10 or IL-4 results in a decrease in Fru-2,6-P2 content (C). Results show the mean ± SD of five experiments. *p < 0.05; **p < 0.01; ***p < 0.001 versus resting macrophages (A). *p < 0.01 versus untreated cells; #p < 0.05 versus the LPS condition (C). The aforementioned differences in transcription of the glycolysis gene set between classic and alternative activation of macrophages allowed us to hypothesize that PFK2, one of the key enzymes of the pathway, could be regulated at the protein and/or enzymatic level. Accordingly, the expression of the isoforms of PFK2 and the levels of Fru-2,6-P2 were determined under these conditions as an indication of the capacity of these cells to metabolize glucose (17, 44). As Fig. 4B shows, resting macrophages expressed the L-type isoenzyme of PFK2, but not the uPFK2 isoenzyme, resulting in low steady state levels of Fru-2,6-P2. However, as result of the activation through the classic and innate pathway, but not the alternative pathway, a robust expression of the uPFK2 isoenzyme occurred, concomitant with a 9-fold rise in the PFK2 activity and a 5-fold increase in the levels of Fru-2,6-P2. Interestingly, the levels of expression of uPFK2, and more importantly, the enzyme activity and intracellular concentration of Fru-2,6-P2 exhibited parallel profiles for each activation condition. Moreover, neither IL-4/IL-13 nor IL-10 was able to change the expression pattern of PFK2 or to increase Fru-2,6-P2 levels. To evaluate the capacity of these ILs to influence the response to LPS costimulation, studies were done. As Fig. 4C shows, when combining IL-10 and IL-4/IL-13 with LPS, the intracellular levels of Fru-2,6-P2 were only minimally influenced with respect to the LPS condition, and an important expression of uPFK2 occurred, despite maintaining a certain level of L-PFK2 expression. The time course of the changes in Fru-2,6-P2 (Fig. 5A) was compared with that of uPFK2 (Fig. 5B) and exhibited a parallel pattern. Because uPFK2 expression has been described to be regulated by Hif-1α, the levels of this protein were determined and only the classic pathway was able to promote its expression (Fig. 5B); COX-2 and NOS-2 levels exhibited the expected profile. In addition to these protein levels, the time course of the expression of Hif-1α, uPFK2, IL-10, and Glut-1 and Glut-4 was determined, showing a kinetics compatible with the changes in Fru-2,6-P2 concentration (Fig. 5C). Interestingly, when the mRNA levels of the four PFK2 isoenzymes were determined at 12 h in LPS/IFN-γ–treated macrophages, minimal differences in L-PFK2 expression were observed, whereas uPFK2 and testis-PFK2 were upregulated by classic activation and downregulated in alternatively activated cells (Fig. 5D). Time course of glycolytic changes in activated macrophages. Peritoneal macrophages were activated through the innate, classic, and alternative pathways, and the time course of the levels of Fru-2,6-P2 was determined (A). The time-dependent changes in uFPK-2/L-PFK2, Hif-1α, COX-2, NOS-2, and β-actin (for normalization of lane charge) were determined by Western blot (B). The changes in mRNA levels as fold induction (FI) of Hif-1α, uPFK2, IL-10, Glut-1, and Glut-4 were determined during the initial 12 h after activation and using 36B4 mRNA for normalization (C). The changes in the expression of the mRNA isoforms of PFK2 (pfkfb) in macrophages activated through the classic and alternative pathways were compared at 12 h (D). Results show the mean ± SD of four experiments. uPFK2 has been described to be a gene regulated by Hif-1α (18, 45) and, therefore, the differences in transcription of the glycolysis gene set between classic and alternative activation of macrophages might be explained through the changes in Hif-1α promoted after LPS activation (23). However, as Fig. 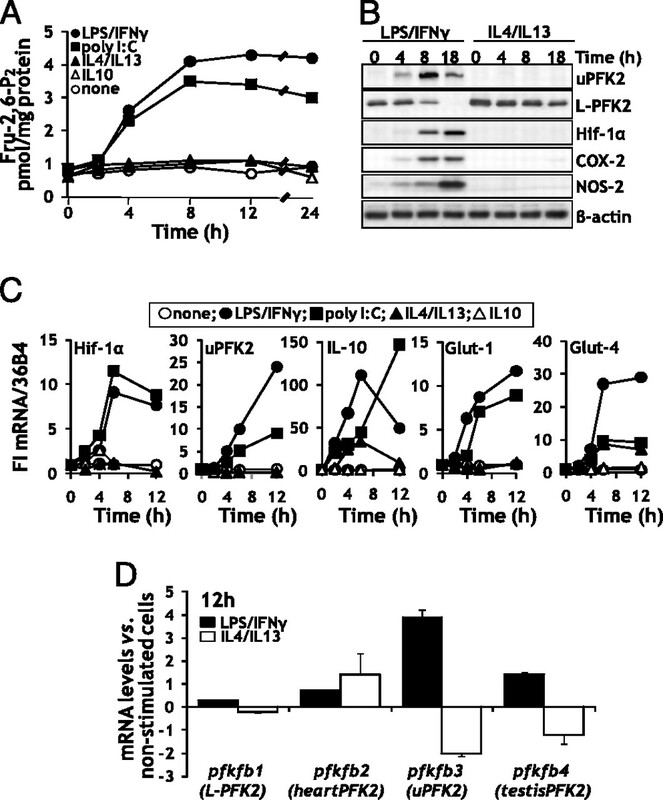 6A shows, targeting of Hif-1α in macrophages failed to induce changes in the levels of Fru-2,6-P2 (cells treated with IL-10 exhibited a similar behavior as with IL-4/IL-13), or in the glycolytic flux measured as lactate release (Fig. 6B), or in the expression of uPFK2 in these cells (Fig. 6C). 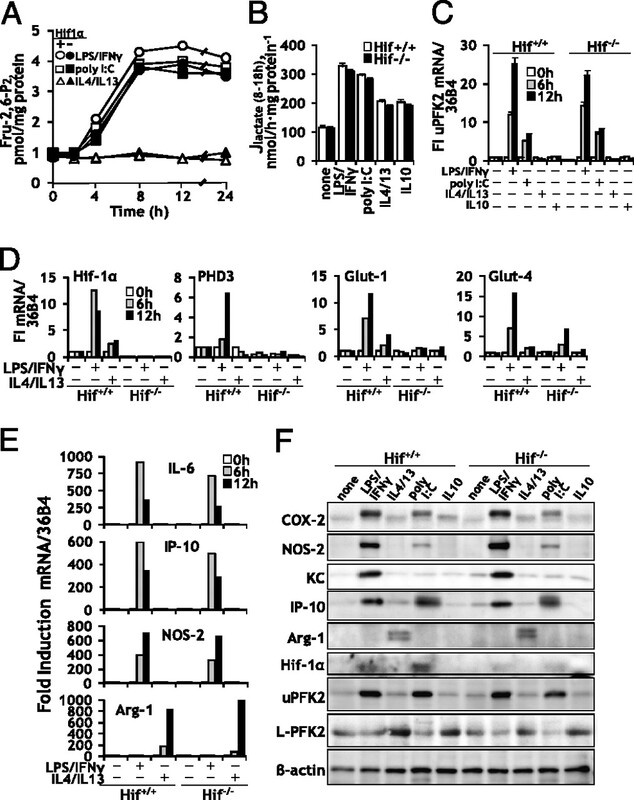 Moreover, the mRNA levels of the Hif-1α– and the Hif-1α–targets PHD3, Glut-1, and, to a lesser extent, Glut-4 exhibited the expected drop in Hif-1α−/− macrophages (Fig. 6D); however, those of the proinflammatory cytokines IL-6 and IP-10, and the inflammatory markers NOS-2 and Arg-1, showed a similar expression in Hif-1α+/+ and Hif-1α−/− macrophages activated with LPS/IFN-γ or IL-4/IL-13, respectively (Fig. 6E). In agreement with these data, the protein levels of COX-2, NOS-2, KC, IP-10, uPFK2, and L-PFK2 did not exhibit differences between Hif-1α+/+ and Hif-1α−/− macrophages; Arg-1 protein levels were slightly higher in Hif-1α−/− cells activated with IL-4/IL-13 (Fig. 6F). Macrophages lacking Hif-1α fail to show changes in the expression of uPFK2 and in the glycolytic flux upon activation. Peritoneal macrophages from Hif-1α+/+ and myeloid Hif-1α−/− mice were activated through the innate, classic, and alternative pathways, and the concentrations of Fru-2,6-P2 (A), the lactate flux (B), and the FI of uPFK2 mRNA (C) were determined. The response of a series of genes involved in hypoxia (Hif-1α, PHD3, Glut-1, and Glut-4) and inflammation (IL-6, IL-10, NOS-2, and Arg-1) was determined at different times upon challenge with LPS/IFN-γ or IL-4/IL-13 (D, E). The levels of a panel of proteins involved in the activation through the innate (polyriboinosinic:polyribocytidylic acid [poly(I:C)]), classic, and alternative pathways were determined at 18 h (F). Results show the mean ± SD of five experiments (B, C), the means of three independent experiments (A, D, E), or a representative experiment of three (F). In view of the minimal effects observed on metabolic fluxes after Hif-1α targeting, the interference of uPFK2 expression was investigated. Using a GFP expression vector as a tracer for the estimation of the percentage of transfected cells, the maximal efficiency was ~30%, and higher levels of uPFK2 siRNA or scRNA resulted in a loss of macrophage viability (Fig. 7A). Fig. 7B shows the analysis of PI-positive cells upon stimulation with LPS/IFN-γ or IL-4/IL-13. Interference of uPFK2 with 100 nM siRNA increased significantly the apoptosis of LPS/IFN-γ–activated cells at 18 h. For this reason, further analyses were carried out in cells after 10 h of stimulation. As Fig. 7C and 7D shows, treatment with uPFK2 siRNA decreased the protein levels of uPFK2, NOS-2, and COX-2, as well as those of the corresponding mRNAs in macrophages stimulated with LPS/IFN-γ. These data suggest that impairment of the expression of uPFK2 results in attenuation of the classic activation of macrophages. However, the loss of viability observed after transfection with siRNA and the moderate efficiency of the process required further approaches to validate the effects due to a reduction in the expression (or activity) of uPFK2. An additional way to circumvent this metabolic aspect is to modulate glucose availability, from 5 to 100 mM, and therefore to modify the glycolytic flux. As Fig. 7E shows, the intracellular levels of Fru-2,6-P2 and the synthesis of lactate and nitrite in LPS/IFN-γ–activated macrophages were modulated by glucose concentration. However, the protein levels of COX-2, NOS-2, uPFK2, and Arg-1 apparently did not show significant differences among the range of glucose concentrations assayed (Fig. 7F). At the mRNA level, small, but reproducible differences in NOS-2 and Arg-1 at 5 mM glucose versus 25–100 mM glucose were observed in macrophages activated for 8 h with LPS/IFN-γ or IL-4/IL-13, respectively (Fig. 7G). Taken together, these data suggest a role for uPFK2 expression and activity in the metabolic activation elicited after LPS/IFN-γ treatment of macrophages. Attenuation of uPFK2 expression impairs macrophage viability upon activation. Peritoneal macrophages were incubated with different concentrations of a GFP expression vector and siRNA specific for uPFK2 or the corresponding scrambled sequence scRNA. The levels of expression of GFP are shown in A. Cells treated with 100 nM scRNA, siRNA of uPFK2 or the transfection reagent (vehicle) were stimulated with LPS/IFN-γ or IL-4/IL-13, and viability was determined after 18 h by PI staining (B). The protein levels of uPFK2, COX-2, and NOS-2 (C) and the FI of the mRNA of these genes (D) were determined at 10 h. Alternatively, macrophages were maintained in culture with 5, 25, or 100 mM glucose in RPMI 1640 medium, and the levels of Fru-2,6-P2 and the accumulation of lactate and nitrite in the culture medium were determined (E). The protein levels at 18 h of genes related to inflammation and uPFK2 were measured by immunoblot (F). The mRNA fold inductions of these genes were determined at 8 h (G). Results show the mean ± SD of four experiments. *p < 0.01 versus the vehicle condition in nonstimulated cells; #p < 0.05 versus the corresponding vehicle condition (B, D); *p < 0.01 versus the corresponding 5 mM glucose condition (E). Previous work established that peritoneal macrophages are essentially glycolytic cells (13, 14, 41, 42, 46, 47). Compared with other cell types, macrophages use mainly anaerobic glycolysis in the metabolization of glucose, and the flux in isolated cells is ~10% of the actual capacity through 6-phosphofructo-1-kinase, one of the enzymes that controls the glycolytic pathway (42). In addition to this, glutamine is converted into glutamate and aspartate, and less than 10% is being oxidized, at the time that fatty acids appear to be the main substrates for oxidative metabolism (41). In the present work, we have assessed the metabolic profiles associated with stimulation of macrophages through three well-defined activation pathways, using a metabolomic approach. The data obtained show that regardless of the stimulation pathway involved, macrophages remain glycolytic cells and accelerate notably the conversion of glucose into lactate when challenged through the classic/innate activation pathways; however, the activation through the alternative pathway exerted minimal effects on the basal consumption of glucose. One of the relevant regulators of glucose metabolism is the rise in the levels of Fru-2,6-P2, which in turn activates the flux through 6-phosphofructo-1-kinase (43, 48, 49). Fru-2,6-P2 is synthesized/degraded by the bifunctional enzyme. Four genes encode the PFK2 in higher mammals. The L type is encoded by the PFKFB1 gene and is mainly expressed in liver, and a splicing variant is expressed in muscle. This enzyme has a balanced kinase/bisphosphatase ratio and, unless the bisphosphatase activity is inhibited, it maintains low levels of Fru-2,6-P2 through a futile cycle of synthesis and degradation of the metabolite (16, 48–51). The uPFK2 encoded by the PFKFB3 gene has a higher kinase activity (~10:1 kinase/bisphosphatase), is induced by hypoxia, and can be regulated by phosphorylation, playing a role in the high glycolytic rate of various cell types, such as cancer cells (18, 43, 45, 49, 52). A relevant finding of this work is the observation that concomitant to the classic/innate activation, there is a significant change in the expression of the PFK2 from the L type to the uPFK2 isoenzyme. 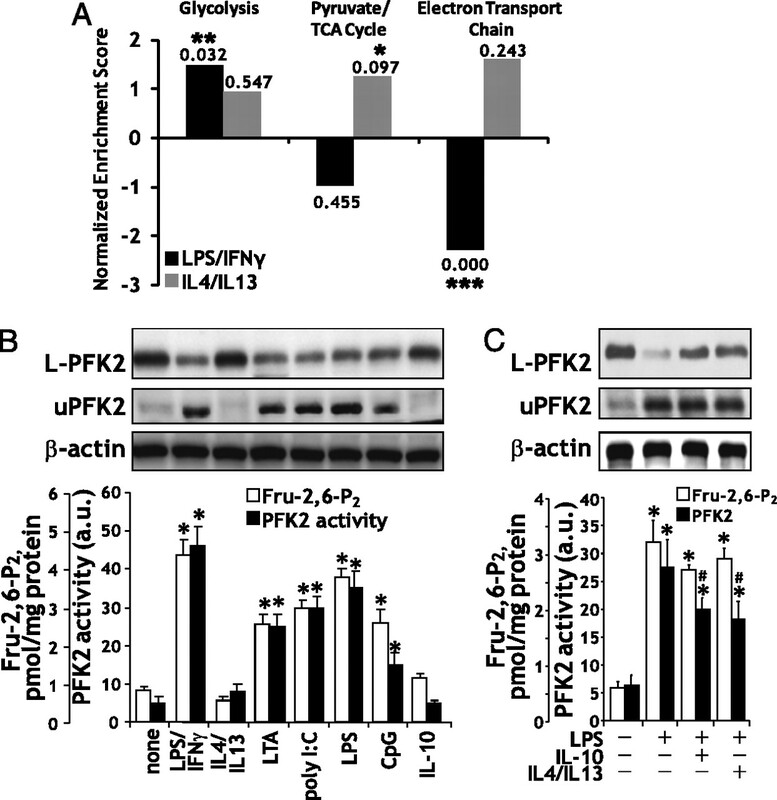 Interestingly, uPFK2 exhibits a higher capacity to accumulate Fru-2,6-P2 in macrophages, due to its lower bisphosphatase activity compared with L-PFK2, which results in an increase in the enzymatic activity determined in vitro, and in the glycolytic flux. Moreover, the substitution between the two isoenzymes is remarkable, and, in fact, the protein levels of L-PFK2 almost disappear and are substituted by the uPFK2 form in the course of TLR-2, -3, -4, or -9 activation, despite the use of nonredundant signaling pathways (i.e., MyD88-dependent and independent pathways). One likely mechanism to explain this switch between PFK2 isoenzymes after classic activation is the rise in the levels of Hif-1α because a functional relationship has been described between the hypoxia-responsive element motifs present in the uPFK2 promoter and the expression of this isoenzyme (16, 18, 19, 22, 23, 53). Accordingly, experiments in macrophages lacking Hif-1α were carried out with the idea to impair uPFK2 expression. However, our data clearly show that classic activation retains almost intact the ability to promote uPFK2 expression, and, indeed, the glycolytic flux was identical to that of parental macrophages expressing Hif-1α after LPS/IFN-γ challenge. These results were unexpected in view of the decreased glycolysis observed in B cells lacking Hif-1α (54). Moreover, a cross-talk between Hif-1α and LPS signaling has been reported in macrophages, and it appears to be involved in the development of immune tolerance to LPS and in sepsis (21, 55, 56). More recently, a specific polarization of classic and alternative activation of macrophages has been attributed to Hif-1α and Hif-2α, with a predominant role of Hif-1α in classic activation, in particular when comparing bone marrow-derived macrophages versus thioglycolate-induced peritoneal macrophages (22). In this regard, a drop in the expression of NOS-2 in bone marrow-derived macrophages from Hif-1α knockout mice challenged with pathogens was previously described (57); however, this is not the case when peritoneal cells were used, probably because of the expression of Hif-2α, as recently reported (22). The question remains on the identification of the regulatory elements in the uPFK2 promoter that are responsible for this induction upon classic activation in the absence of Hif-1α. In addition to other mechanisms, the possibility of the involvement of Hif-2α in the induction of uPFK2 cannot be disregarded, as described in tumor-associated macrophages (23, 58). Next, the expression of uPFK2 was interfered with a specific siRNA. However, primary cultures of macrophages (and also bone marrow-derived macrophages; data not shown) were difficult to transfect and, using concentrations up to 300 nM siRNA, the maximal efficiency was ~35% of the cells with a clear toxicity and loss of viability. Using this approach, it was clearly observed that upon classic activation interfered macrophages exhibited a high apoptotic rate, not observed in the scRNA counterparts nor in the IL-4/IL-13–activated cells, suggesting that the siRNA was decreasing uPFK2 expression and promoting an apoptotic response. In this regard, the levels of expression of some inflammatory markers, such as COX-2 or NOS-2, were significantly attenuated in the absence of uPFK2. Alternatively to this approach, attempts to decrease the concentration of Fru-2,6-P2 via modulation of glucose availability showed that the metabolic activity of enzymes involved in inflammation, such as NOS-2, exhibited a decreased activity at 5 mM versus the cells maintained at 25 and 100 mM glucose. Interestingly, a certain modulation by glucose of NOS-2 mRNA was observed in macrophages activated through the classic pathway. Regarding the mass isotopomer distribution in both resting and activated macrophages, the distribution of the label is essentially identical, confirming the minor impact of cell activation among switching between glucose-fueling pathways. Although the three activation pathways studied involve changes in the expression of a large number of genes, the present work shows that only classic and innate activation through TLRs result in an enhanced expression of PFKFB3 corresponding to a higher activation of PFK2 activity and glycolytic flux. These results correlate with model flux predictions in LPS-stimulated RAW 264.7 cells (data not shown). This model could estimate the central metabolism flux distribution from [13C] labeling data and metabolites consumption and production rates. According to our data and those deduced from published arrays, ATP generation is mainly due to anaerobic glycolysis after innate and classic activation, whereas only minimal differences on glucose metabolism are observed between alternative versus unstimulated macrophages. However, an increase in the expression of genes involved in oxidative phosphorylation has been observed upon alternative activation (Fig. 4A). This metabolic effect upon macrophage challenge is observed both in proliferating (the RAW 264.7 cells) and nonproliferating cells (elicited peritoneal macrophages). However, our results highlight that proliferation has a higher effect on metabolism than that induced by the activation process. Therefore, metabolic changes strictly associated with macrophage activation correspond to results observed in experiments with peritoneal macrophages. Metabolic differences induced by proliferation can be deduced from the experiments reported in Fig. 3. RAW 264.7 cells have higher metabolic fluxes than peritoneal macrophages. Besides, [3C] enrichment in ribose and glutamate was higher in RAW 264.7 to cover the demand in metabolites to proliferate. Moreover, the higher flux through pentose phosphate pathway (PPP) to synthesize nucleotides results in a higher [13C1] lactate abundance (m1) due to the recycling through the nonoxidative branch of PPP. Finally, the lower glycolytic flux in RAW 264.7 indicates that proliferation promotes the recruitment of other carbon source like glutamine in an anaplerotic flux, corroborating the role of glutamine metabolism in macrophage activation already described (12). In conclusion, the data show that the stimulation of macrophages through the classic, innate, and alternative pathways exhibits, as expected, a distinct expression of activation markers due to different signaling events involved in each pathway. However, the innate and classic activation show a higher glycolytic rate versus alternative activation, due to a switch in the expression of PFK2 isoenzymes that appears to be a common event after LPS/IFN-γ or TLR-2, -3, -4, and -9 stimulation. Despite the differences in glucose consumption and lactate release, label distribution analysis shows that there is a common anaerobic pattern followed regardless of the activation pathway. Further studies on the molecular mechanisms that govern the switch between the PFK2 isoenzymes might contribute to unravel metabolic aspects related to accommodation of macrophages to biological microenvironments, such as sepsis, endotoxin tolerance, or tumor growth. We thank Dr. Simon Bartlett for discussion, advice, and critical reading of the manuscript. We thank Dr. Ramón Bartrons (University of Barcelona) for the generous gift of the uPFK2 Ab and Dr. M. de Landázuri (Hospital La Princesa, Madrid) and Dr. Luis del Peso (Instituto de Investigaciones Biomédicas, Madrid) for help on Hif-1. This work was supported by European Commission (FP7) Etherpath KBBE-Grant Agreement no. 222639, Grants SAF2005-01627, SAF2008-00164, and BFU2008-02161 from Ministerio de Ciencia e Innovación of the Spanish Government, 2005SGR00204 from the Generalitat de Catalunya, S-BIO-0283/2006 from Comunidad de Madrid, Red Temática de Investigación Sobre Cáncer (RETICC RD6/0020/0046) and Red Temática de Investigación Sobre Enfermedades Cardiovasculares (RECAVA RD6/0014/006), and FIS-RECAVA RD06/0014/0025. RECAVA and Ciberehd are funded by Instituto de Salud Carlos III. J.-C.R.-P. is supported by a fellowship from the University of Barcelona.
. 2007. The macrophage: past, present and future. Eur. J. Immunol. 37(Suppl. 1): S9–S17.
. 2004. Toll-like receptors: linking innate and adaptive immunity. Microbes Infect. 6: 1382–1387.
. 2007. TLR4-mediated survival of macrophages is MyD88 dependent and requires TNF-α autocrine signalling. J. Immunol. 178: 3731–3739.
. 2005. Nitric oxide and cell viability in inflammatory cells: a role for NO in macrophage function and fate. Toxicology 208: 249–258.
. 2005. Macrophage polarization comes of age. Immunity 23: 344–346.
. 2010. An integrated view of humoral innate immunity: pentraxins as a paradigm. Annu. Rev. Immunol. 28: 157–183.
. 2008. Feeding our immune system: impact on metabolism. Clin. Dev. Immunol. 2008: 639-803.
. 2004. The intricate interface between immune system and metabolism. Trends Immunol. 25: 193–200. 2001. Why is l-glutamine metabolism important to cells of the immune system in health, postinjury, surgery or infection? J. Nutr. 131(Suppl. 9): 2515S–2522S, discussion 2523S–2524S.
. 1992. Stimulation of glycolysis as an activation signal in rat peritoneal macrophages: effect of glucocorticoids on this process. Biochem. J. 282: 299–303.
. 1991. 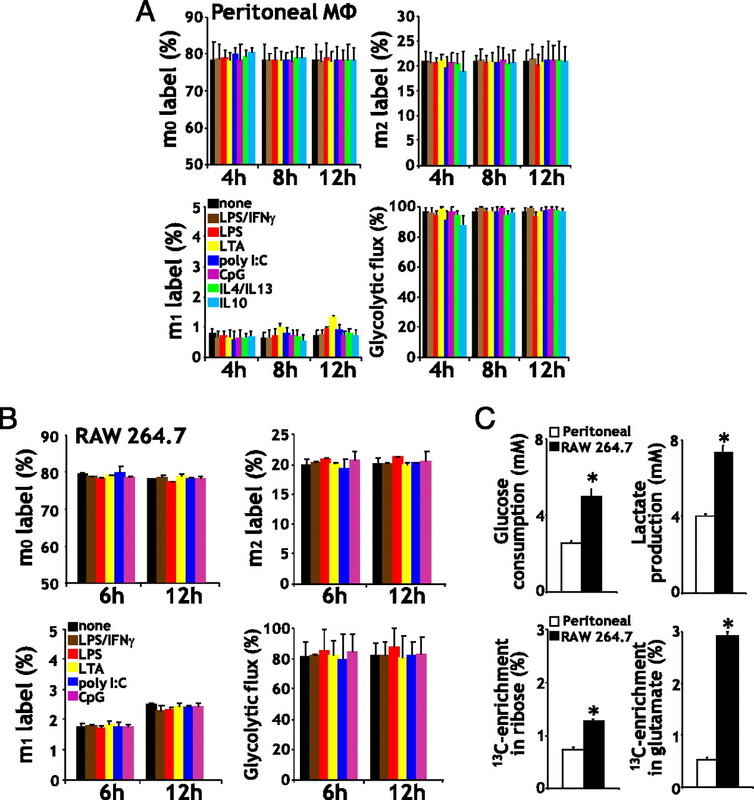 Glucose and glutamine metabolism in rat macrophages: enhanced glycolysis and unaltered glutaminolysis in spontaneously diabetic BB rats. Biochim. Biophys. Acta 1115: 166–173.
. 2008. Metabolomics and fluxomics approaches. Essays Biochem. 45: 67–81.
. 2007. Hypoxia, glucose metabolism and the Warburg’s effect. J. Bioenerg. Biomembr. 39: 223–229.
. 1989. Glucagon-induced changes in fructose 2,6-bisphosphate and 6-phosphofructo-2-kinase in cultured rat foetal hepatocytes. Biochem. J. 257: 795–799.
. 2002. Hypoxia-inducible factor-1-mediated expression of the 6-phosphofructo-2-kinase/fructose-2,6-bisphosphatase-3 (PFKFB3) gene: its possible role in the Warburg effect. J. Biol. Chem. 277: 6183–6187.
. 2004. Identification and characterization of the hypoxia-responsive element of the human placental 6-phosphofructo-2-kinase/fructose-2,6-bisphosphatase gene. J. Biochem. 136: 273–277.
. 2009. Differential regulation of HIF-1α isoforms in murine macrophages by TLR4 and adenosine A(2A) receptor agonists. J. Leukoc. Biol. 86: 681–689.
. 2009. Hypoxia-inducible factor (HIF) 1α accumulation and HIF target gene expression are impaired after induction of endotoxin tolerance. J. Immunol. 182: 6470–6476.
. 2010. Differential activation and antagonistic function of HIF-α isoforms in macrophages are essential for NO homeostasis. Genes Dev. 24: 491–501.
. 2009. Generating specificity and diversity in the transcriptional response to hypoxia. Nat. Rev. Genet. 10: 821–832.
. 2003. HIF-1α is essential for myeloid cell-mediated inflammation. Cell 112: 645–657.
. 2009. Macrophage oxygen sensing modulates antigen presentation and phagocytic functions involving IFN-gamma production through the HIF-1α transcription factor. J. Immunol. 182: 3155–3164.
. 1997. Macrophage triggering with cecropin A and melittin-derived peptides induces type II nitric oxide synthase expression. J. Immunol. 158: 4437–4443. 2004. Linear models and empirical bayes methods for assessing differential expression in microarray experiments. Stat Appl Genet Mol Biol 3: Article 3.
. 2003. PGC-1α-responsive genes involved in oxidative phosphorylation are coordinately down-regulated in human diabetes. Nat. Genet. 34: 267–273.
. 2009. Reactome knowledge base of human biological pathways and processes. Nucleic Acids Res. 37(Database issue): D619–D622.
. 1974. l-(+)-Lactate determination with lactate dehydrogenase and NAD. In Methods in Enzymatic Analysis, 2nd Ed. Bergmeyer H. U., J. Bergmeyer, M. Grassl, eds. Academic, New York, p. 1464–1468.
. 1984. d-Glucose: UV-methods with hexokinase. In Methods of Enzymatic Analysis, III, Ed. Bergmeyer H. U., J. Bergmeyer, M. Grassl, eds. Verlag Chemie, Weinheim, Germany, p. 163–172.
. 1998. Mass isotopomer study of the nonoxidative pathways of the pentose cycle with [1,2-13C2]glucose. Am. J. Physiol. 274: E843–E851.
. 1989. Studies of glycogen synthesis and the Krebs cycle by mass isotopomer analysis with [U-13C]glucose in rats. J. Biol. Chem. 264: 12994–13004.
. 2002. Metabolic profiling of cell growth and death in cancer: applications in drug discovery. Drug Discov. Today 7: 364–372.
. 1996. Mass isotopomer study of glutamine oxidation and synthesis in primary culture of astrocytes. Dev. Neurosci. 18: 469–477.
. 2003. Sustained nitric oxide delivery delays nitric oxide-dependent apoptosis in macrophages: contribution to the physiological function of activated macrophages. J. Immunol. 171: 6059–6064.
. 2002. Induction of apoptosis by nitric oxide in macrophages is independent of apoptotic volume decrease. Cell Death Differ. 9: 643–650.
. 1989. Rates of utilization of glucose, glutamine and oleate and formation of end-products by mouse peritoneal macrophages in culture. Biochem. J. 261: 211–218.
. 1987. Rates of utilization and fates of glucose, glutamine, pyruvate, fatty acids and ketone bodies by mouse macrophages. Biochem. J. 242: 631–636.
. 1986. Metabolism of glucose, glutamine, long-chain fatty acids and ketone bodies by murine macrophages. Biochem. J. 239: 121–125.
. 2005. Phosphorylation of the 6-phosphofructo-2-kinase/fructose 2,6-bisphosphatase/PFKFB3 family of glycolytic regulators in human cancer. Clin. Cancer Res. 11: 5784–5792.
. 1992. Phorbol esters, bombesin and insulin elicit differential responses on the 6-phosphofructo-2-kinase/fructose-2,6-bisphosphatase system in primary cultures of foetal and adult rat hepatocytes. Eur. J. Biochem. 207: 391–397.
. 2004. 6-Phosphofructo-2-kinase (pfkfb3) gene promoter contains hypoxia-inducible factor-1 binding sites necessary for transactivation in response to hypoxia. J. Biol. Chem. 279: 53562–53570.
. 1993. Modulation of glucose metabolism in macrophages by products of nitric oxide synthase. Am. J. Physiol. 264: C1594–C1599.
. 1995. Impact of nitric oxide on macrophage glucose metabolism and glyceraldehyde-3-phosphate dehydrogenase activity. Am. J. Physiol. 268: C669–C675.
. 2001. PFK-2/FBPase-2: maker and breaker of the essential biofactor fructose-2,6-bisphosphate. Trends Biochem. Sci. 26: 30–35.
. 2004. 6-Phosphofructo-2-kinase/fructose-2,6-bisphosphatase: head-to-head with a bifunctional enzyme that controls glycolysis. Biochem. J. 381: 561–579.
. 2005. Targeted disruption of inducible 6-phosphofructo-2-kinase results in embryonic lethality. Biochem. Biophys. Res. Commun. 331: 139–146.
. 2009. Regulation of glucose metabolism by 6-phosphofructo-2-kinase/fructose-2,6-bisphosphatases in cancer. Exp. Mol. Pathol. 86: 174–179.
. 2006. PFKFB3 gene silencing decreases glycolysis, induces cell-cycle delay and inhibits anchorage-independent growth in HeLa cells. FEBS Lett. 580: 3308–3314.
. 2010. 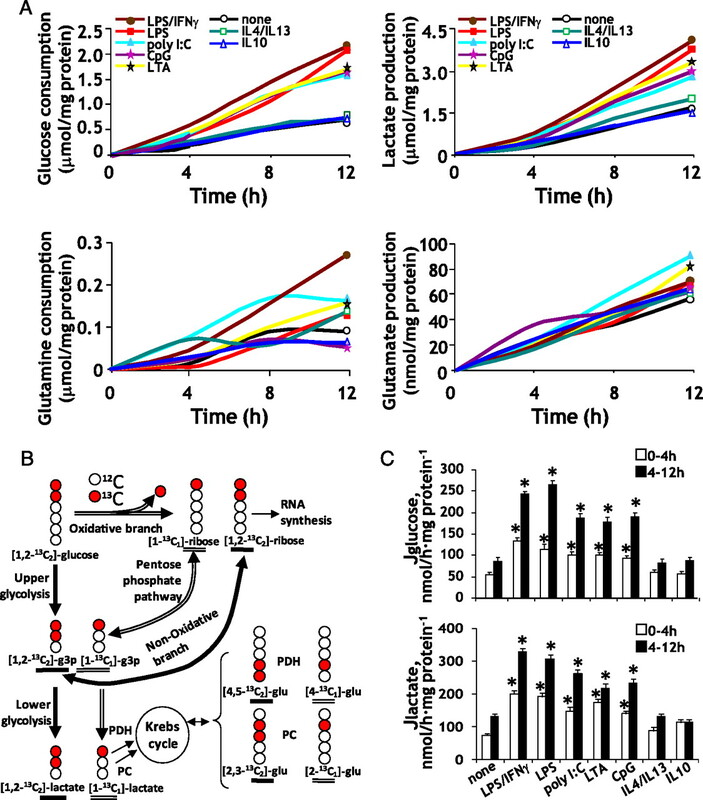 The intravenous anesthetic propofol inhibits lipopolysaccharide-induced hypoxia-inducible factor 1 activation and suppresses the glucose metabolism in macrophages. J. Anesth. 24: 54–60.
. 2010. Differentiation stage-specific requirement in hypoxia-inducible factor-1α-regulated glycolytic pathway during murine B cell development in bone marrow. J. Immunol. 184: 154–163.
. 2004. Hypoxic gene activation by lipopolysaccharide in macrophages: implication of hypoxia-inducible factor 1α. Blood 103: 1124–1130.
. 2007. Cutting edge: essential role of hypoxia inducible factor-1α in development of lipopolysaccharide-induced sepsis. J. Immunol. 178: 7516–7519.
. 2005. HIF-1α expression regulates the bactericidal capacity of phagocytes. J. Clin. Invest. 115: 1806–1815.
. 2000. The expression and distribution of the hypoxia-inducible factors HIF-1α and HIF-2α in normal human tissues, cancers, and tumor-associated macrophages. Am. J. Pathol. 157: 411–421.